A TETRA two-way radio with professional features, for all-around use. 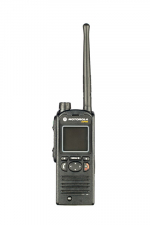 The Motorola CEP400 TETRA two-way radio is an upper-mid-range TETRA device. Unlike the MTP series (the MTP3250, for example), the CEP400 does not have a full keypad. However, there's a benefit to that: the device is easy to use with gloves on. That's why we mainly recommend it for simpler tasks, like communication in workshops (assembly, service/maintenance, etc.). For larger TETRA projects, a radio with a full keypad is a must. Individual contacts in the CEP400's "telephone book" can't be selected directly on a keypad; the arrow keys must be used for this purpose, limiting direct-dial convenience. But if the number of contacts doesn't reach much over 30, and if direct-dialling remains the exception (because most communication takes place in talkgroups), the Motorola CEP400 TETRA two-way radio offers terrific performance at a very reasonable price. The CEP400 is a very "glove-friendly" TETRA two-way radio. All buttons can be operated easily, even by users wearing regulat gloves. Even the PTT button, on the right side of the device, is easy to feel and has a solid press-point. For all these reasons, the CEP400 is an excellent choice for industrial use, especially in the service/maintenance area, where gloves are usually required. The CEP400 benefits from the same best-in-class audio tech advances used in Motorola's Mototrbo series DMR radios (like the Motorola DP4800). The results are audible: Superb speech intelligibility, even in challenging environments. Like all our Motorola two-way radios, the CEP400 belongs in our "rock-solid" category. The CEP400's body weighs about 170g; about 240g with a battery. The Motorola CEP400 is an upper-mid-range TETRA two-way radio at an entry-level price. Its functionality is comparable to that of MTP series radios(like Motorola MTP850S or Motorola MTP850). The few Motorola CEP400 units in our rental inventory are mainly used for outfitting large construction projects (airports and the like). For larger projects, or if no TETRA cell (-> Motorola MTS1) is available, you may want to consider our MTP series TETRA two-way radios or our digital radios. Of course, we don't just rent TETRA two-way radios, we also sell them, and we look forward to your inquiry. You'll get excellent value, plus our reliable Enterprise Service and an extended warranty for your Motorola CEP400. We're also pleased to offer the CEP400 on a rent-to-own (hire-purchase) plan. We'll be glad to provide you with advice, free of charge. Do you have plans for particular applications, or do you want to develop an application of your own? As certified Motorola Application Developers, we've got skilled specialists to assist you in those areas too. When you rent digital two-way radios (including the CEP400) with Radio-Rental.com, you get an unbeatable value that includes free delivery and our 24/7 support. We look forward to receiving your rental request by phone at +49 30 29381970, by e-mail mail@Radio-Rental.com . We look forward to your inquiry! Should you have further questions about the Motorola DM3400 or any of our other Motorola two-way radios, we'll be very glad to advise you.